Born: May 31, 1903, Litchfield, Crawford County, Kansas. Married: Alvin Curtis Todd, August 7, 1935, Topeka, Kansas. Died: July 17, 1996, Topeka, Kansas. Quality education was of utmost importance to Lucinda Todd. As a schoolteacher and then as a parent, Todd wanted to increase educational opportunities for African American students. She was born May 31, 1903, to Charles Richard and Estella (Slaughter) Wilson, in Litchfield, Kansas, a coal mining community in southeast Kansas. Her parents had moved to Kansas in 1879 from the South. Todd attended school in Girard, and graduated from Pittsburg State University with a bachelor's degree in education. She taught school from 1928 until she married Alvin Todd in 1935 and was forced to give up her career. She turned her focus toward advocacy, serving as the secretary of the Topeka Chapter of the National Association for the Advancement of Colored People (NAACP) beginning in 1948; McKinley Burnett was chapter president. When the Topeka Daily Capital published a column in 1948 about "militant groups" attempting to "do away with colored schools" and praising the "bang-up job of education" that existed in the black schools, Todd responded. "If by wanting my child to have equal education I am being 'militant' then thank God I am militant," Todd wrote. Headquartered at the Todd's house, the Citizens Committee on Civil Rights formed to push for change. A leaflet to support a petition drive titled "The People Fight Back" outlined the ban of African American students at a dance, along with other examples of segregation. They obtained 1,100 signatures but the school board failed to respond to their request for change. The Topeka chapter welcomed Walter White, the executive secretary of the NAACP, to Topeka in 1949. While in Topeka, he stayed in the Todd's home. There White predicted the eventual end of segregation in the U.S. In August 1950 Todd wrote to White to ask for legal support. "Our situation has become so unbearable that the local branch has decided to test the permissible law which we have here in Kansas," Todd said. White referred Todd's request to the legal department. Charles Bledsoe, an attorney for the Topeka chapter, began correspondence with NAACP legal counsel Robert L. Carter. Within a few days, Carter shared his initial thoughts and strategies in a letter to Bledsoe. The Todds also had a personal reason to push for change. Their daughter, Nancy, was forced to ride a bus to an all black school, while the neighborhood school was located within a few blocks of their home. In spring 1950 Todd noticed a newspaper article announcing an upcoming concert by all "18 Topeka elementary schools." The article also referenced an instrument loan program. Topeka had 22 elementary schools; the black schools were excluded. Todd protested and was able to change a few of the discriminatory policies. Nancy was then able to begin violin lessons and continued piano lessons. 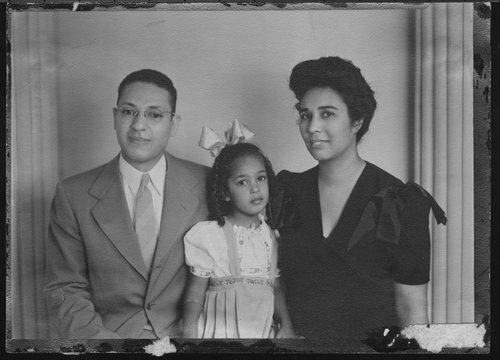 Todd was among the parents who attempted to enroll their children in neighborhood schools in summer 1950. They were all denied admittance to the white schools. With the help of the NAACP Legal Defense Fund, the group of 13 parents on behalf of their 20 children filed a class action suit in U.S. District Court against the Topeka schools in February 1951. In August 1951 the district court ruled in favor of the school board, finding the facilities "separate but equal," but acknowledging that black children were "adversely impacted" as a result. In September 1951 Carter wrote to Herbert Bell, president of the Abilene chapter, and several other NAACP chapters in Kansas, indicating his intention to take the case to the United States Supreme Court. He also wrote to Burnett and Todd estimating the cost would be about $5,000 and suggested that they undertake a statewide fundraising effort. Todd spoke to organizations around the state and beyond to help raise funds. The Supreme Court agreed to hear the Topeka case along with segregation cases from three other states and the District of Columbia. Arguments were presented in December 1952 and then again in December 1953. Soon after the famous unanimous decision May 17, 1954, Todd returned to teaching where she continued to help students secure a quality education. Nancy eventually majored in music therapy.